Do you live on a busy street or hear non-stop noise pollution? Hardscape fencing can be gorgeous and very effective at providing both privacy and wind protection. Of course, many HOAs and cities have ordinances that prohibit the height of fencing somewhere between 4 and 6 feet tall. Sometimes, the best privacy solution may be a combination of hardscape and “softscape” – which means environmentally friendly live plants. Read on for details on solutions, selection, siting and spacing. What Kind of Privacy Do You Need? Evergreen conifers and broadleaved evergreens hold on to their foliage year round. 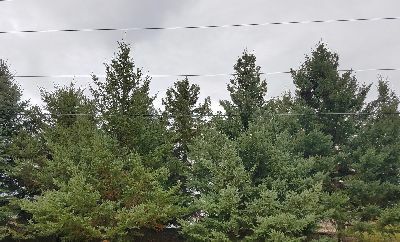 If you have a large expanse of unsightly views, such as roadways, railroads, commercial sites, or parking lots, you’ll want to use evergreens in your privacy plan to completely screen them all the time. Adding an evergreen privacy screen in this case will add value to your property! Evergreen plants display a huge amount of diversity in terms of form, shape and size – so study the Plant Highlight Facts on every product page to learn the height and “spread” (or width) of the plant. Evergreen trees provide wonderful color in cold weather. 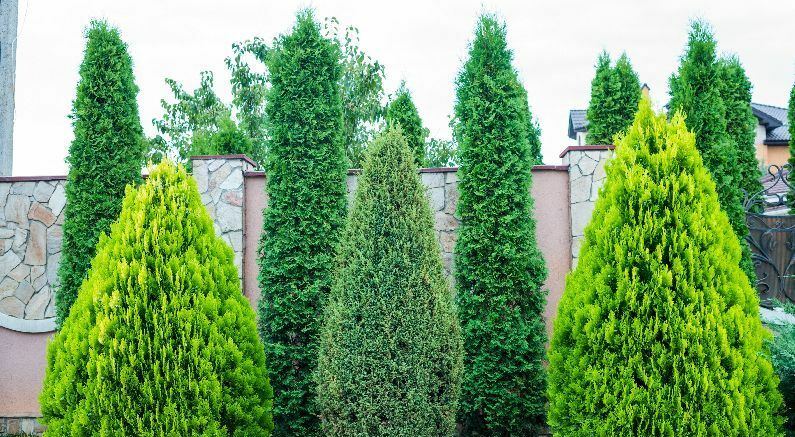 Evergreen trees are versatile and can be used as specimens, hedges, and privacy screens. In a short period of time, look what Green Giant Arborvitae can do for your property! This planting has only been in for a little over 10 years. Even when the plants were smaller, they were trapping snow, blocking wind and unsightly views. No pruning was done. These Green Giant were allowed to grow naturally and why not? 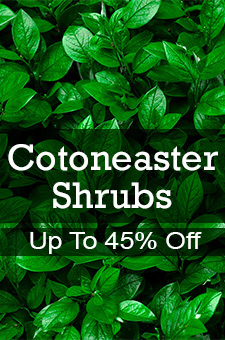 They grow to 50 feet tall and 18 feet wide with soft sprays of bright green foliage. Now, you may want to create an effective outdoor room for summertime fun without sacrificing precious winter sunlight. In that case, use deciduous trees and shrubs, which lose their leaves in winter. These come in many varieties, and you can enjoy the added benefit of flowers which bring beautiful butterflies. 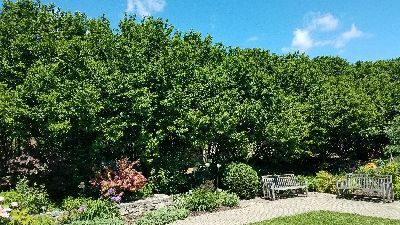 For an easy way to create an incredible outdoor room, plant ornamental trees in a row closely enough so they grow together. Crabapples, Ornamental Pears or Ornamental Cherry trees all would work to do something like this. This photo shows a disease-resistant Red Jewel Crabapple. The homeowner loves the unbelievable pink bud-white flower cloud of bloom, followed by green and disease-free foliage all summer. 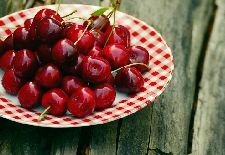 Let’s not forget the ruby red fruits that are showy from late summer and persist all winter long. Show-stopping red fruit then feeds the migrating robins, cedar waxwings and many other birds in late winter and in the spring. 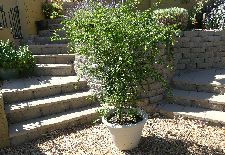 Plant these along a hardscape fence, or “underplant” them with smaller shrubs to achieve a complete screen from top to bottom. Magnolias are another flowering tree that are often used as screening plants with their lower limbs allowed to fill in naturally without pruning. What a gorgeous spring flower to look forward to! Ok, this is a no brainer. When putting together your privacy plan, select trees that reach the right height to reach your screening goal when they’re full grown. 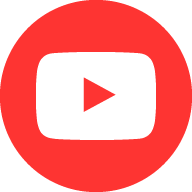 But here are some expert tips you may not have considered. If you’re planting along neighboring property lines, give the plant enough leeway to reach its full width without going over into the neighbor’s yard. Please select carefully when planting under overhead power lines, or along walkways, driveways or patios. Don’t create more work for yourself! Choose the right variety that grows the right size for your space rather than having to regularly prune for size control. Check with your local city zoning ordinances as you are planning your privacy screen or hedge to ensure you meet restrictions for height and setbacks from your property line. Special restrictions will apply to corner lots and along driveways. Trust us, it’s not fun to finish installing a beautiful new living fence only to be told you have to move it back five feet from your lot line! It definitely pays to do your homework. If you have specific guidelines to follow, do yourself a favor. Choose a variety that remains under the height requirements, or you’ll give yourself a lifetime task of regular pruning. Far better to work with the right plant in the first place. Now, let’s say you have an upstairs window that overlooks a neighbor’s master bath. (Why do builders do that?) You might choose to selectively plant for privacy to simply block that window. Filter our plant offerings by height and width (spread) to find just the right option to solve your unique privacy challenge. Modern plantsmen are now breeding columnar varieties that grow up tall, straight and skinny. You’ll also want something that grows fast, so a Theves Poplar or Leyland Cypress (which grows up to 4 feet a year!) may be a good choice for you. Sometimes you don’t have a lot of room between houses. When space is tight, nice options include Sky Pencil Holly, North Pole Arborvitae or Blue Arrow Juniper. These beauties can be planted close together every two feet on center. Measure and dig the holes with uniform spacing so the center of each hole is the same distance between plant. These super skinny plants make superior privacy screens close to your patio or home with little care or maintenance. Upright Castle Spire Holly shrubs can also be used with a seasonal prune for size control. If you are planting these in a somewhat tight space, these plants can be spaced as little as two feet up to four feet on center. Did you know that live plants absorb sound? Plants with long needles, dense branching and lots of surface area can actually absorb a lot of sound and the ability to do so increases as the plants grow. If you live in an area with winter snow and you’ll be planting along a road or highway, be sure to choose plants that can tolerate brackish – or salty – soil. Junipers can tolerate salt. Check with your local agriculture extension office to get their opinion on trees that perform well in your area. Are you looking for privacy up close to your patio, or do you need privacy for a large open area? The amount of space you have will determine what kind of plants to use for that particular situation and the proper spacing required to get the job done. First, look at how wide the plant you are considering using will spread. 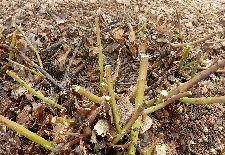 A four foot wide plant at maturity means it will grow about two feet on either side of the main stem of the plant. Split the mature width listed on our website in half to know how far apart these plants can be planted before they would touch. If you want the plants to grow together to create a solid screen, then shorten the distance between plants by a foot. Please note that you’ll also need to measure the width of the actual plants you are installing. If you buy larger plants, you’ll get a big head start on privacy, as you’ll plant them closer together when you first install them. Arborvitae are excellent plants to use for screening because they can be planted closer together without the plants ruining each other. A row of tightly spaced Arborvitae become one solid mass of soft, feathery foliage from the ground up. They are very forgiving and can be pruned along the tops of the plants which will widen out the growth a bit and thicken up the quality of the growth. Don’t Make These Mistakes When You Plant Your Privacy Fence! You may feel a little like Goldilocks as you plan your privacy fence. Don’t plant too far apart, but don’t plant too close together, either. 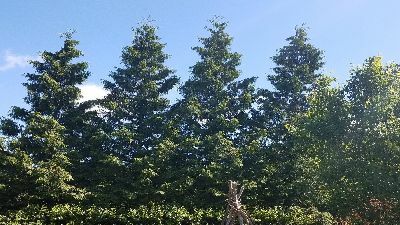 These Norway Spruce were planted too far apart from each other 25 or 30 years ago and they never formed a privacy screen. Instead, they appear as individual plants. Sometimes people make the mistake of planting for privacy too far apart and the plants will never touch to form a screen of any kind. Then you would end up with a row of individual plants, not what you want. Remember to carefully calculate half of the mature width to know when the plants would touch at maturity. On the other hand, you’ll want to use care when spacing plants that you don’t overcrowd them. Give the plants enough room to “just” touch their neighbor. Planting too close together to an effort to achieve immediate privacy will lead to crowding between neighboring trees. 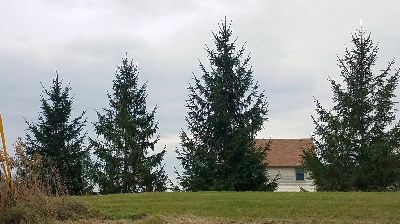 Spruce trees planted too close together will shade each other out and cause branches to die out. Ouch! Far better to save up and spend money on buying the largest container size you can. These are older trees that have received expert care. You’ll get an immediate sense of the character of the tree and will see a big impact in your landscape. Win, win! If you prefer a formal look, create a privacy fence of a single variety planted in a straight line, evenly spaced. A straight line of plantings can help you to maximize the space in your yard while also giving you the privacy you desire. You might choose to create a formal hedge using Boxwood, Yew or Privet which can be sheared every year. This works best on a level site. Be warned, it’s going to take work to achieve perfection with this technique. You’ll need to prune regularly, and it doesn’t hurt to keep your fingers crossed that all the plants perform well in order to achieve a consistent look. For a more natural look, consider planting privacy trees in a slightly staggered row. These plants can also be planted a bit farther away from your home or outdoor space allowing them to attain their natural form. The space between the plants can be increased to accommodate the mature width of the plant. 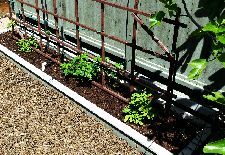 Take a page out of a farmer’s windbreak by growing two rows of privacy trees. Plant fast growing trees in the back row and slower growing trees like the densely branched Spruce in the front row. When the slower growing trees reach the desired size, remove the shorter lived trees in the back row. Use larger plants in back and include both deciduous and evergreens to make an interesting mixed privacy screen and windbreak. Don’t forget to add color, flower and wildlife appeal in your privacy plan. Mix Lilacs in the cooler climates and Crape Myrtles in the warmer climates into evergreen fences. Birch trees have that interesting peeling bark, which shows up so well against evergreens. 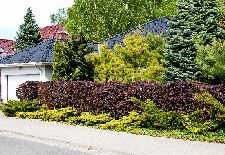 Creating a “shrub border” mixed with privacy trees is a great way to create year-long interest in your yard – a perfect backdrop to fun outdoor activities. You’ll attract beneficial insects and birds with more diversity. This is the same principle as those ancient British “hedgerows” of mixed varieties that contained livestock and delineated property boundaries. Map out your design on paper first and use a repeating pattern for good results. Remember, plants look most natural in odd numbered clustered groups of 3, 5, 7 or 9. Look for opportunities to add interest that you’ll enjoy from your living room or deck. Trying to cut down on wind? A quick solution to reducing wind and snowdrifts would be the addition of a natural, elongated planting on the north and/or west side of your property. A double row of White Spruce worked out well to screen off a property from a north facing windy location and a highway. Live plants block winds and can act as snow fencing in colder regions. A windbreak privacy plan will protect valuable fruit trees and tender garden plants from prevailing winter winds. You’ll appreciate the extra protection inside the house, and save a little on energy costs, too! If you have recently moved into the area or to your house, call the local airport to find out the direction of your prevailing winds. It’s usually either north, northeast or northwest. Plan to place your windbreak at right-angles to the wind and typically between 40 to 80 feet away from your house for best results.